Our Luxury Accommodation includes Guest House Suites, as well as Self Catering Units. A great place for private morning, afternoon and evening weddings, or functions. Helen de Beer opened this unique guest house in 2008 with only two rooms. It has since grown into a fully functional guest house with 14 executive suites, with a fine dining restaurant on the premises. 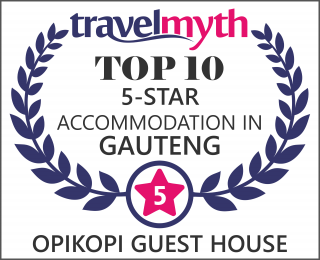 Opikopi Guest House has won a number of awards of which we are very proud and has also been awarded the TripAdvisor Excellence Award for 2015. All full HD DSTV channels are available in every guest room, making your stay a more enjoyable one. Free high speed Wi-Fi internet access, and many other special amenities on offer at Opikopi Guest House.